Picks up all furni in a room except wallpaper/flooring at once. Opens up the latest news on the main page. It used to open the News Tablet at the right side of the client window. Shows player holding up a sign. Pick a number between 0-18 for the "#" slot. Entering any other command, for the sign, will result in a character '# 1 Sign'. For example, typing ":sign Habbo" will result in this. Typing this makes your Habbo laugh. Mutes all pet speech in the room you're currently in (for you only)! Typing : x while clicking someone allows you to say that persons name without having to type their name manually. Typing :mutebots, makes it so you cannot see the speech said by Bots in a room. Enables you to eject all furni in a group room. This means you can even eject other Habbo's furni without having to manually eject. Opens up the minimail in-client. If you are the room owner, saying this will mute the selected user in your room for two minutes. This has the same effect as the :shutup [Username] command. If you are the room owner or moderator, saying this will kick the selected user in your room. This command resizes the room you are currently in. Type :zoom 1 to revert to normal zoom. You can also user CTRL (Windows) or CMD (Mac) + Mouse Wheel Up/Down to zoom in or out. This turns the room you are currently in upside down. It only affects the room, not the client interface. To fix it click on the zoom button or reload the room. This command is probably a reference to the video game DOOM. IDDQD was the god-mode cheat in DOOM. This command was added to the game as an easter egg by Habbo developer Macklebee. This takes a screenshot of the room you are currently in and saves it to your computer. Takes a picture of furniture only, doesn't include the UI and size of the image depends on where the furniture is in the room. Hides your mouse cursor in the client. It also hides the white square that appears when you hover over floor tiles. It can be reverted by saying :hidemouse a second time. Gives your character a lightsaber. Using the chooser command is a very simple way to find a person in a huge crowd. All you have to do is type : chooser (without the space) and a box will pop up with everyone in the room. All you need to do is search for that person in the chooser box! The furni command is exactly the same as the chooser command. To use the furni command all you need to type is : furni (without the space) and a box will pop up (like chooser) with all the furni in the room! You need to either have rights in the room your using the furni command or you have to be the room owner. Shows the 'blowing a kiss' animation. Typing :kick followed by a username of the person you want to kick in a room you have kicking rights to, kicks that person from the room. Administrators of a group cannot use this command however. Typing :pickallbc, picks up all Builders Club furni in a room. This is useful if you made a room that has both Builders Club and non-Builders Club furni, but only want to pick up the Builders Club furni and leave the non-Builders Club furni in the room. Outputs the name of the owner of the bot. Outputs the name of the room the bot is currently in. Outputs the name of the bot. Displays the amount of furniture in the room. Displays the amount of floor furniture in the room. Displays the amount of wall furniture in the room. Displays the amount of users in the room. Some people might feel like being lazy and therefore don’t type the entire word they mean, or shorten a phrase such as ‘Laugh Out Loud’ to just ‘lol’, which makes it easier for them and easier for you, providing you know what it means. If you don’t know what things mean, you can find out below! 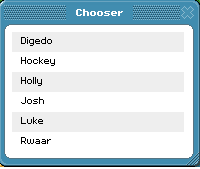 Many people in Habbo try to enhance their room names to make them stand out, or just want to make their writing fancy with lots of small images in, these small images are ‘alt codes’. Why? That would be because you have to use the alt key to produce them, as well a short number code. To use an alt code on a Desktop PC, Simply hold down the alt key (usually near the space bar) and enter the relevant code shown below, before doing this ensure num lock is on. There are two ways to put Number Lock on using a laptop. On laptops without a number pad at the side of the keyboard you should press the fn key (usually near the space bar) and the num lock key (usually F11). On other laptops just press Num Lock and a light will appear somewhere on your keyboard. After doing this Num Lock has been enabled, now hold alt and key in the desired numbers for the alt image you want.